Producciones de la Hamaca « How on Earth Do We Live Now? How on Earth Do We Live Now? 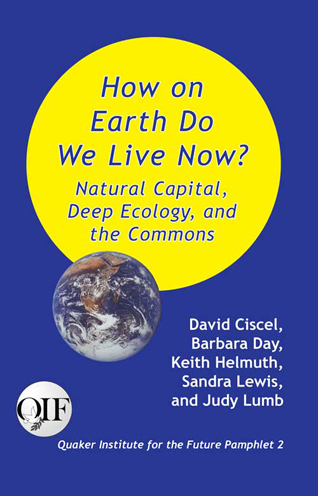 Natural Capital, Deep Ecology, and the Commons was written by David Ciscel, Barbara Day, Keith Helmuth, Sandra Lewis, and Judy Lumb, and published for Quaker Institute for the Future by Producciones de la Hamaca, Caye Caulker, BELIZE - 80 pages (2009). The natural capital and deep ecology approaches both address the question: “How on Earth do we live now?” Our high energy industrial economy is crashing into the reality of Earth’s ecology, and a massive environmental crisis is unfolding from this incoherent human-earth relationship. To explore these two world views, we asked David Ciscel to join the Quaker Eco-Bulletin editorial team in a Circle of Discernment under the Quaker Institute for the Future (QIF). We explored the history and development of current public policies in regard to two essential parts of Earth’s commons: property and water, both of which require major changes in governance. We studied systems of governance from private property to self-governing community-based trust organizations and the nature of human behavior from individualistic to cooperative. We asked what unique contributions Friends bring to the table as we all face the realization of the enormity of the change that is needed for a sustainable and just human-earth relationship.